CenterPoint offers an educator-driven lineup of professional learning services. Through collaborative partnerships, we provide professional learning to help districts meet academic goals. From custom onsite programs to on-demand, interactive webinars and courses, we work as thought partners to plan the best approach. We build open, on-going relationships with professional learning, school improvement, curriculum, and leadership teams. Our approaches are informed by years of expertise and experience and supported by quality resources. The result is professional learning that builds educator capacity in implementing college- and career- ready standards using research-based and best practice strategies. Working together, we help our partners achieve measurable, sustainable gains in educator effectiveness and student achievement. In our professional learning programs, we employ approaches consistent with adult learning theory—including time for participants to actively engage in tasks, practice or plan for implementation of new learning in job-embedded contexts, and reflect on and process new ideas. Working together, our team and district leaders design programs to deepen teachers’ understanding and implementation of college- and career-ready standards, increase the relevance and usability of data from local assessments to drive instruction, and develop customized curriculum and materials of instruction with alignment to state expectations. CenterPoint Education Solutions uses research-based practices in the design and delivery of professional learning services. We draw from national bodies of research and groundbreaking studies including the work of the National Early Literacy Panel and other research commissioned by the U.S. Department of Education; studies implemented by professional organizations such as ASCD, NCTE, and NCTM; and those conducted by key university research centers such as the Dana Center at the University of Texas, Austin. Our staff have worked directly with national experts who developed best practices for adult learning, and we design our services to embed within systemic structures already in place (e.g. developing recorded webinar materials that can be used by participants during their professional learning communities or providing sample resources and a protocol for aligning standards in facilitated lesson studies). Our experts offer a combination of deep knowledge across content standards—mathematics, English language arts (ELA)/literacy, social studies, science, career and technical education, and early literacy—as well as advanced expertise in pairing instruction and assessments to address those standards. Our services build curriculum knowledge, assessment literacy, and create alignment between the written, taught, and tested curriculum. We help our partners deepen instructional leadership capacity, and, equally important, we include approaches to support ELL students and those with identified special needs. Our team includes seasoned educators who have held state, district, and school leadership roles and who have worked as building leaders, instructional coaches, teacher-leaders, and data and literacy coaches. Our professional learning team averages more than 20 years in education at both the district and classroom levels, so we understand personally and professionally the challenges educators face every day. We tap the knowledge of education and assessment thought leaders and nationally recognized experts to ensure validity, reliability, and usability of our resources. Our professional learning services are designed and delivered by the same team who helped build nationally recognized assessments aligned to college- and career-ready standards. We’ve worked directly with schools, districts, and assessment and instructional leaders on those initiatives, and our experiences inform our services and programs. Those experiences, along with our partners’ specific needs, inform our Professional Learning Services. We provide a variety of flexible options and approaches to meet specific content, scheduling, and budget needs, from custom consulting and onsite professional learning sequences, to custom and live webinars. We use highly interactive, scenario-based approaches so teachers are involved and engaged right from the start. We guide and coach participants in applying new content and strategies in the classroom. Each experience is increasingly engaging, and teachers can integrate their new learning successfully and confidently. CenterPoint’s mission is to empower educators to help all students succeed – and that drives the design of our professional learning services. All our sessions are designed to close pervasive achievement gaps and increase the accessibility of deep learning for all students. Our professional learning sessions always include research-based ideas for ensuring accessibility of content for students with a variety of needs. We also focus on providing strategies that teachers can use to support students with identified special needs and English language learners. Strategies and resources for increasing student achievement for highly able students are also introduced, since differentiating instruction for students across the performance continuum while maintaining access to high expectations for all is a key component of CenterPoint’s solutions. Districts and schools can use our Partnership Resource Center, a web-based professional learning resource with a dynamic collection of materials, instructional tools, lesson and unit plans, and ready-made tests aligned to the standards. 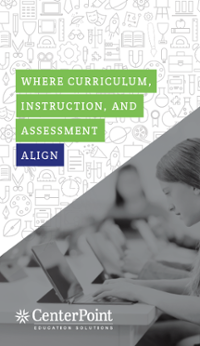 It’s a one-stop, easy-access portal for teachers, curriculum teams, and administrators to use to strengthen and support instruction. Our professional development programs may be offered for district-wide, single, or multiple school-based teams of teachers, instructional coaches, support staff, and/or leaders. The specific grade-level bands and standards that are addressed in our sessions can be customized to meet a district’s unique needs. CenterPoint can provide on-site, live professional learning sessions, facilitate engaging online-based sessions for a distributed audience, or develop customized recorded sessions for educators to reference anytime, anywhere. Our sessions can support blended learning models to incorporate flipped learning opportunities (e.g. use of recorded webinars to provide content information prior to or after face to face sessions), use of video models, and interactive, web-based software to fully engage adult learners in professional learning sessions.